The Mississippi River flows from Minnesota across the middle of our country to the Gulf of Mexico, providing water and life to millions on its way. Proper care of the river here results in cleaner water and better conditions downriver. Augsburg University is the official “steward” of the stretch of riverbank on the west side of the Mississippi River from the Bohemian Flats to the I-94 Bridge near Augsburg’s Campus. 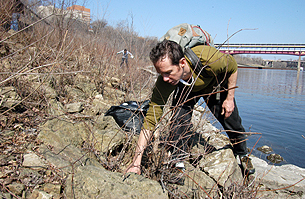 As river stewards, Augsburg community members clear litter and other debris from the riverbank. This keeps pollutants out of the water and provides a safer environment for wildlife that might become entangled in the items humans have discarded. Augsburg also hosts the River Semester, a fully-immersive educational experience for students to travel the Mississippi River by canoe for 100 days each fall semester.